Kootu is a family favourite with the elder son and his father being especially partial to it. In fact, even if he were served kootu everyday, the husband wouldn’t complain. I remember my Mother-in-law telling me he was called Kootu Pehalwan, when he was young, as he would demolish the better portion of the kootu all by himself! Kootu means ‘combination’ in Tamil. The name perhaps came from the fact that several vegetables are used together in the dish, though it is also made with just one vegetable. 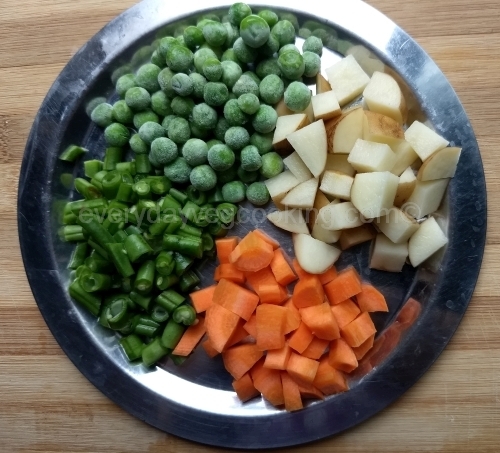 Some vegetables and kootu are made-for-each-other. Snake gourd and field beans (sem/papdi) for instance. They impart a special flavour to the dish. Though we can use just about any vegetable for kootu, some vegetables just don’t gel with the kootu. Cauliflower, for instance. But cabbage tastes great. Likewise white pumpkin is good in kootu, but not yellow pumpkin. The latter taste great in sambar though. Personally, I love a combination of French beans, carrots and peas as it makes for a very colourful kootu. Very convenient when there is not enough of a one vegetable to make a stir-fry, which I usually make almost every day. I add a potato to bring them all together. I am sharing the recipes of three types of kootu here. The first one, Molagoottal is so called as it has pepper in it and is a traditional Tamil kootu. (Milagu/molagu is pepper in Tamil). The second one has unroasted masala and the third one is my favourite lazy one! Soak the moong dal for half an hour. Pressure cook the dal and vegetables with turmeric powder for 2 whistles. Let the pressure come down by itself. In the meanwhile, take half a tsp of oil and saute the urad dal till the dal almost turns golden. Add the chilly and pepper and fry a little. Add the jeera and coconut and heat it through. No need to saute it much. Switch off the heat. Let the roasted masala cool. Grind into a fine paste adding a little water. Open the cooker, add the ground paste and a few of the curry leaves. Add the required salt and bring to a boil. Heat a tsp of oil and add mustard. When it sputters, add the urad dal. When the dal turns golden, add curry leaves and hing. Pour into the kootu. 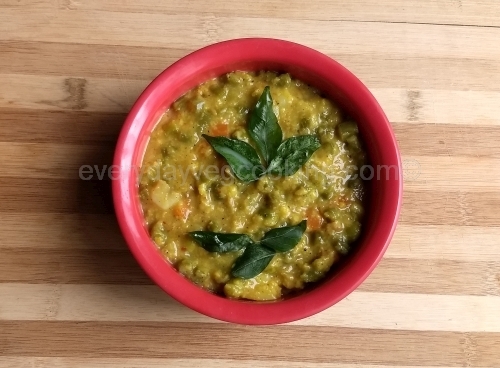 Cook dal and vegetables as for Molagoottal. Grind all the ingredients raw and mix with the cooked dal and vegetables. Add salt according to taste and water as per your requirement. This kootu is generally a little runny. Tempering is the same as for Molagoottal. Add the soaked dal, vegetables, salt, haldi, and 2 tsp of rasam powder. For best results use my recipe of rasam powder. Remove after 2 whistles. 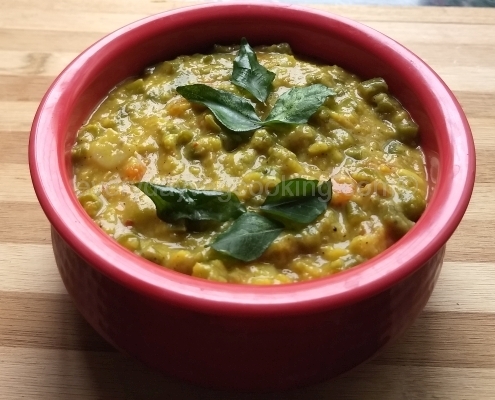 I use moong dal with chilka too, for my lazy kootu! 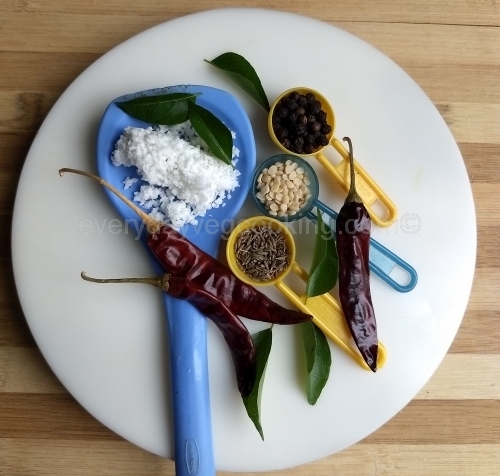 Make a tadka of the mustard, urad dal, hing and curry leaves. To make it look as if you have worked hard, you can saute a tsp of grated coconut and pour add it to the kootu! Your tasty, delicious and very easy kootu is ready! This goes well with both rice and roti/paratha. You can use toor dal also instead of moong dal. But you have to cook it separately as the vegetables will get too mushy if cooked along with the dal. Loved it! Am surely going to try it. Hey nice to see you here! Do try it. It is a staple in our house! 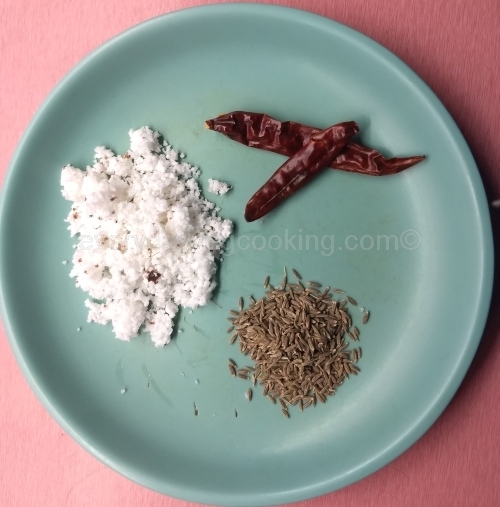 All the three recipes are very easy and soon I will make kootu . It is! Do try it out!